In the automotive industry, innovation and convenience are at front and center in all things. For audio systems – also known as infotainment systems in today’s market – Apple and Android devices have carved themselves a permanent home. And to accommodate the general public’s heavy reliance on their mobile devices, Apple Carplay and Android Auto have been integrated. If you have an Android device, Android Auto applies to you. Android Auto has a simple purpose: to seamlessly integrate your Android smartphone into your vehicle’s audio system. The main benefit is safety – you can keep your hands on the steering wheel while you drive instead of fiddling with your device in your hands. The other major benefit is convenience – you can access many apps, from iHeartRadio and Spotify radio apps to Kik and Skype messaging apps. And in case you’re still using your smartphone as a talking device, you can place calls through Bluetooth. An Android Auto head unit displays select apps on the screen and is controlled through voice activation. While most manufacturers offer Android Auto as part of their new vehicles for the 2018 model year, older vehicles aren’t equipped with Android Auto. That can change, though, if you replace your car’s radio with an Android Auto aftermarket head unit. Whether you’re looking for the best Android head unit, the cheapest one, or the best-rated one, you’ll find it here. And if you’re looking for the best double-din head unit for Android Auto, you’re in luck. Because of their purpose, they are all touchscreen units and are all double-din in size. If you’re looking for the cheapest android auto head unit, you might want to hold tight a little longer. 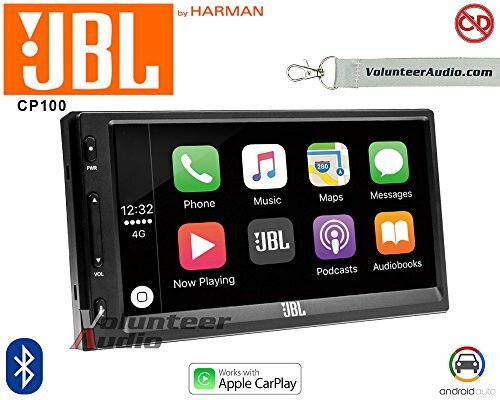 JBL has promised the release of the JBL Legend CP100, a fully capable multimedia receiver that includes Android Auto in its abilities. The JBL Legend CP100 has a 6.75-inch touchscreen, so like all the others, it’s a double-din unit. It has two sets of pre-outs on the back of the head unit for use with amplifiers, making this system versatile. It’s also compatible with a backup camera, which is sold separately. And, to round things out, it maintains operation of your steering wheel audio controls. Kenwood’s offerings include the Kenwood eXcelon DDX9902S receiver with 6.95-inch screen, which has been around for a little while. Because it’s spent a couple years on the market already, its technology was a little underwhelming. The screen clarity is less crisp than others, and its Android Auto functions don’t always function as they should. That said, it’s still pretty decent, especially for the price. The DDX9902S uses your phone for navigation capabilities. Maps display on your screen and you can control operation through the voice controls, the touchscreen display, or on your phone. You can also mirror your Android device directly using an HDMI cable. Three RCA pre-outs allow you to expand on your audio system with ease. For families like ours with both Android and Apple users, devices can be swapped simply by plugging in the phone. The Pioneer AVH-4200NEX DVD receiver might be the best android auto head unit for the price. It’s packed full of features and is the highest rated unit on the list with 4.4 stars. This unit has a 7-inch screen, maxing out the 2-din opening in our dash and making touchscreen operation easy. It works with both Android Auto and Apple CarPlay. It has that neat Pioneer feature known as MixTrax which we love. It puts together a non-stop playlist of all your music, in case you don’t want the responsibility of being the DJ. Its DVD system is a little dated because navigation maps are downloaded through your device. Nonetheless, it has DVD capabilities. Two RCA pre-outs allow for expansion. If you want your steering wheel controls to function, you’ll need the Maestro system from iDatalink. If you’re searching for a Pioneer android auto head unit, you won’t find one better than the AVIC-8200NEX. It’s the bees knees, as they say, wrapping together all of the best features you’ll find. There are outputs for separate rear-seat monitors and the onboard navigation maps with 7.9 million points of interest are a huge bonus. Like your smartphone, you can pinch and zoom on the screen for your maps. It doesn’t come without its issues though. The AVIC-8200NEX is heavy with features, which means more software and things to go wrong. Pioneer has been slow with firmware updates so crashes can happen or and we found that functions freeze up at times. And while it’s one of the most advanced units on the market, we’d expect better support for the price paid. That’s why it receives 3.9 stars. It has a 7-inch screen, Total Traffic, SIRI Eyes Free, AppRadio, SiriusXM, and much more. iDatalink Maestro integration, available separately, will maintain your steering wheel controls too. One of the rare offerings from Sony for the Android Auto head unit market is the XAV-AX100. The unit isn’t the best or the fanciest you can buy, but it does the job nicely if you want an Android Auto-compatible radio for your car. The screen is quite a bit smaller than most of the others at 6.4 inches. That might not seem like much difference, but it’s noticeable. Unlike the majority of touchscreen systems, Sony adds a rotary control for volume and selection, as well as a couple other buttons on the left side. That’s why the smaller screen, obviously, and we appreciate the added level of functionality. It does take away from the sleek look though. Sony’s receiver is compatible with a backup camera, sold separately, and your factory steering wheel controls with the iDatalink Maestro RR kit, also sold separately. There are three pre-outs for audiophiles to add components and a 10-band EQ to finetune your sound. Beware that the unit is probably a little deeper than others, so if your installation area is really tight, you might want to choose a different option. The Sony XAV-AX100 is rated as a 4.2-star purchase on Amazon. If you’re only interested in a Kenwood Android Auto head unit, the DDX9703S could be the one. The 6.95-inch screen is almost as large as you can get for the size, yet the front panel still has room for slim buttons mounted at the bottom. The DDX9703S supports two connected devices at a time and also supports Android Rapid Charge. The DVD capabilities are extensive yet we find them outdated. Because we almost exclusively use mobile devices, there’s little chance we would ever use the DVD/CD slot. Instead, streaming audio and SiriusXM satellite radio are of more benefit for our needs, although SiriusXM requires an added receiver and subscription. A few standout features are dual camera inputs, three sets of pre-outs, and rear video output to add a gaming console or additional monitor. The Kenwood DDX9703S receiver has its downsides too, and the 4.1-star rating tells you it’s less than perfect. The screen could be brighter, the menus are a little cumbersome, and the audio quality isn’t as good as it should be. All in all, it’s a decent buy from Kenwood. This could possibly be the best Android compatible head unit, available through an industry leader, Pioneer. The AVIC-5100NEX is the middle-of-the-range model that features GPS navigation, DVD/CD/USB/Bluetooth input, and supports SiriusXM satellite radio with an added module. Depending on your needs, the screen size can be an upside or a detractor. It’s the smallest of the group at 6.2 inches, but that allows for a nice complement of buttons along the left side. If you prefer button controls to a touchscreen like we do, this is hugely convenient. The AVIC-5100NEX has a bunch of industry-standard features from AppRadio and SIRI Eyes Free (for Apple users) and is known to have great sound quality. One exclusive feature from Pioneer we absolutely love is MixTrax, which assembles a playlist of all your music for non-stop entertainment. It might not seem like a big deal, but it works wonders. The Pioneer AVIC-5100NEX is one of the highest-rated Android Auto systems, receiving 4.3 stars on Amazon. While there are plenty of aftermarket radios available from many different brands, Android Auto is still a bit scarce. For the capabilities of Android Auto, you can expect to pay a couple hundred dollars more than a unit without. That said, you’ll appreciate spending the extra dough. The best-priced unit is the JBL Legend CP100 (if it’s ever released) at around $400. If you’re looking for the most capable, you’d be better off choosing the Pioneer AVIC-8200NEX with its grocery list of options. All things told, we think you’ll be satisfied with any of the choices on the list.